Brief CV: Yannis A. Phillis was born in 1950 in Nauplion, Greece. He received a diploma in electrical and mechanical engineering from the National Technical University of Athens, Greece, and the M.S. and Ph.D. degrees from the University of California, Los Angeles. From 1980 to 1986, he was with Boston University, Boston, MA. Since 1986, he has been with the Department of Production Engineering and Management, Technical University of Crete, Chania, Greece where he is professor and Director of the CAM Laboratory. 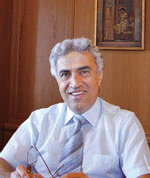 He was also Rector of the Technical University of Crete for 10 years until 2005, and current Rector. Education: Diploma (1973), Electrical and Mechanical Engineering, Technical University of Athens, Greece. MSc (1978), Engineer Degree (1979) and PhD (1980) in Dynamic Systems control, UCLA. Research Interests:Stochastic Models of Unreliable Production Networks, Transfer Lines, Flexible Manufacturing Systems, Applications of Fuzzy Logic to Manufacturing and Queuing, Environmental Systems, Sustainable Development. Laboratory: Computer Aided Manufacturing Laboratory.